The only way to end administrative bloat, then, is to cut off its sources of funding. Students, parents, states, and the federal government must reward efficiency and real academic activity on campus, not ever-growing administrative activity. This contradicts the conventional wisdom that the problem has been a proliferation of provosts, vice provosts, deans, assistant deans, and other upper-level administrators. But it certainly explains at least part of the increasing cost of higher education. Even low-level administrators don’t come cheap. There are many possible explanations for this phenomenon. 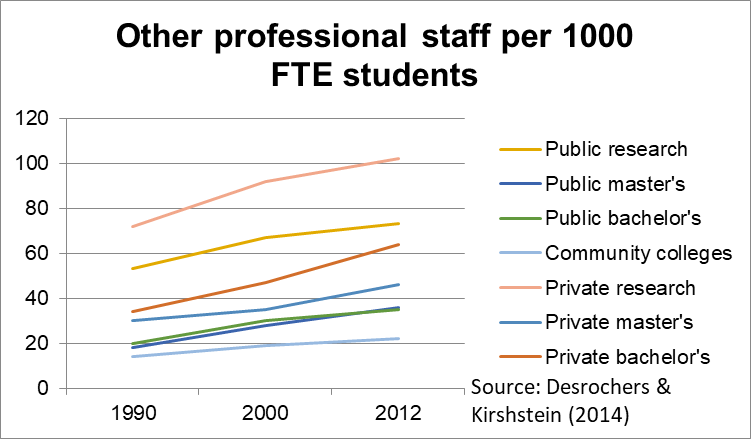 Kelchen posits a few, including the hypothesis that students are demanding more services than in the past. Of course, that may be the case. But the underlying cause was explained in the 1980s. Howard R. Bowen explained this in his book, Costs of Higher Education, a revenue theory of cost for university spending—including spending on administration. The main goals of higher education institutions are excellence, prestige, and influence, measured in various college rankings as top administrators’ opinions of their “peer” institutions. Each institution raises as much money as it can, in order to keep up with the Joneses (aka the Ivies). Because there is no profit that is disbursed to shareholders, as there would be with private corporations, and therefore no need to hold down costs, the institution spends all the money it raises. And of course, once a bureaucracy is in place, it’s very hard to cut.